It's unclear why we humans feel compelled to kiss small furry creatures, but, man oh man, do we want to. For the most part, this desire is as harmless, if a little strange. Unless it's a hedgehog. The Centers for Disease Control and Prevention (CDC) is asking that Americans chill out on the hedgehog kissing for a second. Yes, that sentence is strange, but it's true. "Don’t kiss or snuggle hedgehogs," the agency warned on Friday, "because this can spread Salmonella germs to your face and mouth and make you sick." The government agency is concerned about a Salmonella typhimurium outbreak it believes stems from hedgehog smooching. It also stressed that the famously cute animals "can carry Salmonella germs in their droppings while appearing healthy and clean." 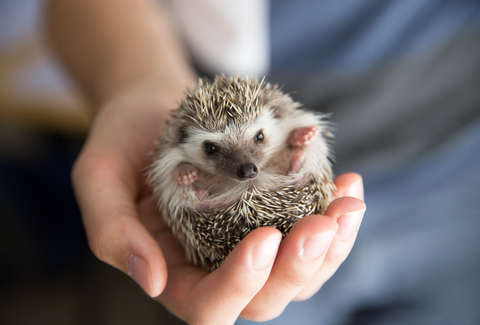 A total of 11 people across eight states -- Colorado, Maine, Minnesota, Mississippi, Missouri, Nebraska, Texas, and Wyoming -- have become ill after hanging out with hedgehogs. One person was even hospitalized. Reports of sicknesses started back in late October, and 10 of the 11 infected people interviewed by the CDC reported that they'd come in contact with a pet hedgehog. Thankfully, there have been no deaths yet linked to the outbreak, but Gizmodo points out that a similar one in 2013 did lead to the death of a Washington man. Salmonella can lead to diarrhea, fever, and stomach cramps, and typically lasts about four to seven days. But if you're not treated with the proper antibiotics, it can be lethal. Look, we're really sorry to tell you not to kiss and cuddle these adorable creatures. But we also really don't want you to get salmonella.